German Chancellor Angela Merkel is urging Egypt's new rulers not to exclude the Muslim Brotherhood from the political process as they work on plans for the future. In an interview with ARD television Sunday, Merkel reiterated Germany's call for the release of Mohammed Morsi, a Brotherhood leader who was ousted as Egypt's president by the military nearly two weeks ago. The U.S. has backed that call. Merkel said Egypt should embark on an "inclusive process" that accommodates all groups. She added: "Others were excluded by the Muslim Brotherhood; the opposite must not happen now." She insisted that everything must be done to find a "common path" forward. Morsi's supporters have refused to accept his ouster or the military-backed timeline for transition, which calls for constitutional changes and new elections. Angela Merkel has plenty to do in declining Europe. Rather than opine on Egypt, she should worry about the instability in Greece, caused by the devastating "bailout" she forced on that country along with the IMF. 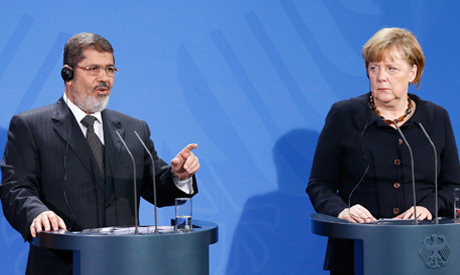 Merkel knows nothing about the Brotherhood or Egypt's internal affairs. In any case, no one really is interested in Germany's opinion on Egypt. That said, Eygptians beware. A Merkel style austerity plan is coming to you soon if the IMF has its way. I believe she should mind her own business and not interfere in Egypt's internal affairs. Merkel should close her wide mouth, because she has'nt any idea about real situation on the ground in Egypt as well her foreign minister puppet Westerwelle. Instead to comment on others, please open an intensive and real discussion in Germany about your and yours government involvment in NSA-scandal and you have to do for months. Governing with survey results only is by fare not enough.